Today, much to my surprise, is ‘World Baking Day’ – presumably a day for amateur bakers everywhere to rejoice and celebrate with a few cakes, biscuits, breads and the like, what better way to celebrate? Home baking is undoubtedly on the rise thanks in part to the success of “The Great British Bake Off”, Paul Hollywood and the legendary Mary Berry. As an amateur baker myself – purely as a way to de-stress, relax and escape from the crazy world of IT - what better day is there though for me to start blogging about my own baking and cooking exploits than this very day? It will certainly make a change from writing about technology and Microsoft! So without further ado, here is my first baking post, hope you enjoy! Whenever I watch any sort of food or cooking show on TV, the one thing that I always notice is just how many of the chefs have all of their ingredients stored in glass jars, seemingly making it incredibly easy to store, air tight and make pouring and measuring the ingredients look rather easy when in front of the TV cameras. Of course, having seen so many jars on TV I, of course, had to replicate this set up in my own kitchen. 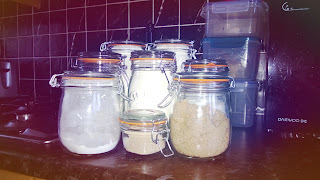 Kilner seems to be the brand to buy, so off I went to locate and purchase them for storage of all my flours and sugars. Having used them for a few months now, I have to admit that I have developed a little bit of a fondness for my jars. They look so much better than storing ingredients in the paper containers that flour and sugars are bought in, but more than that I find that the glass jars have a great tactile feel to them that just bring a smile to my face every time I get to grab one out of the cupboard and measure out its contents. There is a downside to my jars though; I seem to have developed a bit of an obsession with them and seem to look at them in the various cook shop stores, having to tear myself away from buying another – there is always something that can be stored within a glass jar! Despite managing to resist buying another thus far, I do want one more as I’m hoping to create a sourdough starter for my next bready projects I hope to attempt at some point. I blame ‘The Great British Bake Off’ for my obsession with jars (although they aren’t solely responsible), and am already pining for a freestanding mixer having seen them in just about every baking challenge. My research has already been complete, I know exactly which one I want, I just have to persuade myself into treating myself to one now – and justifying buying one rather than continuing to use my Maximix food processor. Undoubtedly I will succumb to my desires and buy one – but it all started with the jars. Oh the simple, glass storage jar!